Indiana University South Bend is a member of the PICO Collaboration which has announced world-leading limits in the search for dark matter from its latest experimental run using the PICO-60 bubble chamber. This new result is a factor of 17 improvement in the limit for spin-dependent WIMP-proton cross-section over the already word-leading limits from PICO-2L run-2 and PICO-60 CF3I run-1 in 2016. The PICO-60 experiment is currently the world’s largest bubble chamber in operation; it is filled with 52 kg of octafluoropropane and is taking data in the ladder lab area of SNOLAB. The detector uses the target fluid in a superheated state such that a dark matter particle interaction with a fluorine nucleus causes the fluid to boil and creates a telltale bubble in the chamber. The PICO experiment uses digital cameras to see the bubbles. Acoustic pickups, designed and fabricated at IU South Bend, are used to distinguish between dark matter particles and other sources when analyzing the data. 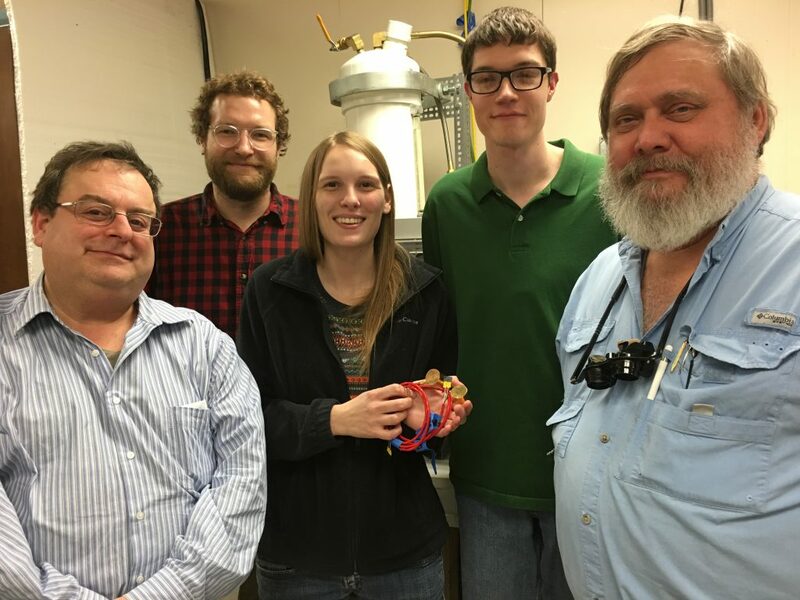 Astroparticle team at IU South Bend: Front (left to right) Professor of Physics and Astronomy Ilan Levine, undergraduate Physics major Haley Borsodi, Engineer Edward Behnke. Back (left to right) IU South Bend graduate (BS, Physics) Thomas Nani, undergraduate Physics major Aaron Roeder. Not pictured: postdoctoral researcher Orin Harris and IU South Bend graduate (BS, Physics) Jonathan Wells. The superheated detector technology has been at the forefront of spin-dependent searches, using various refrigerant targets and two types of primary types of detectors; bubble chambers and droplet detectors. PICO is the leading experiment in the direct detection of dark matter for spin-dependent couplings and is developing a much larger version of the experiment with up to 500 kg of active mass. This work was supported by the US National Science Foundation under Grants PHY-1242637, PHY-0919526, PHY-1205987 and PHY-1506377, and in part by the Kavli Institute for Cosmological Physics at the University of Chicago through grant PHY-1125897, and an endowment from the Kavli Foundation and its founder Fred Kavli. 16 participating Institutions: University of Alberta; University of Chicago; Czech Technical University; Fermilab; Indiana University South Bend; Kavli Institute for Cosmological Physics; Laurentian University; Universite de Montreal; Northwestern University; Universidad Nacinal Autonoma di Mexico; Pacific Northwest National Laboratory; Queen’s University at Kingston; Saha Institute of Nuclear Physics, India; SNOLAB; Universitat Politecnica de Valencia; Virginia Tech. The PICO Collaboration (formed from the merger of two existing groups, PICASSO and COUP) uses bubble chambers and superheated fluid to search for dark matter. The PICO-60 detector consists of a fused-silica jar sealed to flexible, stainless steel bellows, all immersed in a pressure vessel filled with hydraulic fluid. Eight lead zirconate (PZT) piezoelectric acoustic transducers mounted to the exterior of the bell jar record the acoustic emissions from bubble nucleation and four 2-megapixel resolution fast CMOS cameras are used to photograph the chamber. The PICO-60 detector was built at Fermilab in Batavia, IL and installed underground at SNOLAB in 2012. The PICO bubble chambers are made insensitive to electromagnetic interactions by tuning the operating temperatures of the experiment, while the alpha decays are discriminated from dark matter interactions by their sound signal, making these detectors very powerful tools in the search for dark matter. PICO is operating two detectors deep underground at SNOLAB: PICO-60, a bubble chamber with 52 kg of C3F8 and PICO-2L, another bubble chamber with 2.9 kg of C3F8. SNOLAB is Canada’s leading edge astroparticle physics research facility located 2 km (6800 ft.) underground in the Vale Creighton Mine. The SNOLAB facility was created by an expansion of the underground research areas next to the highly successful Sudbury Neutrino Observatory (SNO) experiment. The entire laboratory is operated as an ultra-clean space to limit local radioactivity. With greater depth and cleanliness than any other international laboratory, it has the lowest background from cosmic rays providing an ideal location for measurements of rare processes that would be otherwise unobservable.